This is from the movie American Zombie. When I saw it in the movie, I was like “Damn! I need one of those.” Then when I bought the DVD, it came as a freebie. I was very happy and I haven’t taken it off since. 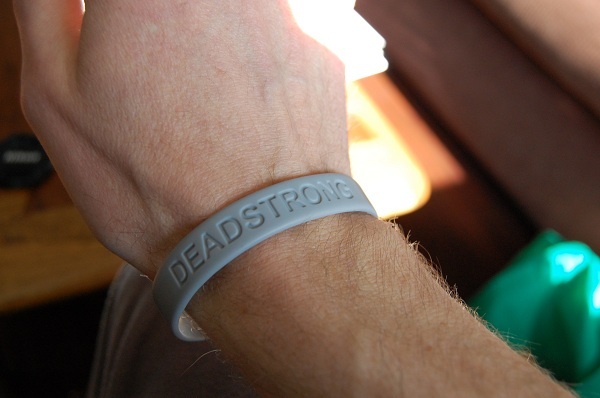 As you can see, it says “DEADSTRONG.” The other side has the movie name, American Zombie. I wear a lot of zombie shirts and what not. Some of my very favorites are from Zombie!, a musician/clothing designer I met when Rob Zombie’s lawyers tried to shut him down. Luckily, Rob Zombie is a cool guy despite having some douchey lawyers (is there any other kind, really?) and told his lawyers to back off. 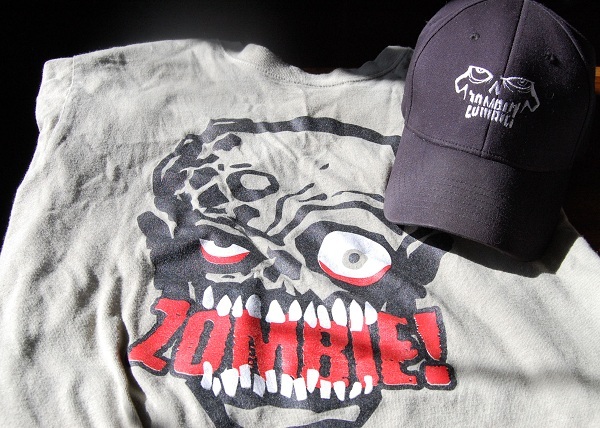 Eric Weiss, the man behind Zombie!, sent me a bunch of his stuff to thank me for helping him get the word out. I wear the hat a lot, since I frequently am in need of a haircut (I seem to miss a lot of my hair appointments for whatever reason). The shirt is my favorite of his many excellent designs. 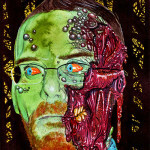 That’s a zombie portrait of me. 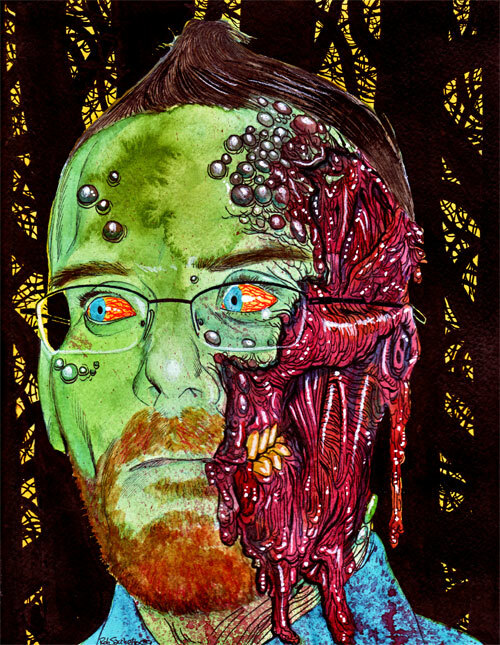 It was done by Rob Sacchetto of Zombie Daily and Zombie Portraits. It’s one of my favorite things, period. I use the digital version as my avatar here, on Twitter and on Facebook. The framed version of this hangs right inside our front door. My fiancÃ©e bought this for me on my previous birthday. 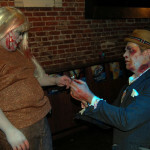 See, given her distaste for zombies, it’s obvious the woman really is crazy about me. Can you blame her, really? 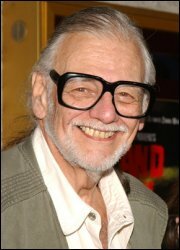 Finally, George A. Romero. There’s not a day that goes by when I don’t think about, and thank, the man. He’s an incredibly influential filmmaker. 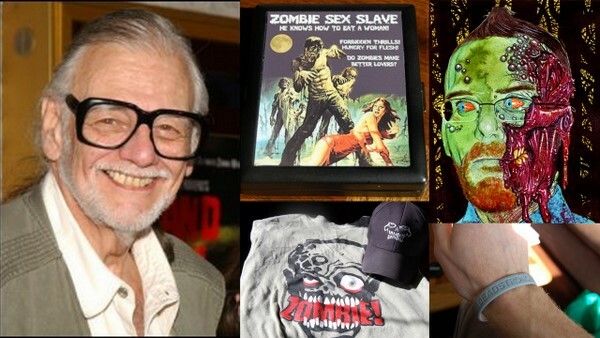 His impact on horror and independent film is enormous — his impact on the zombie genre specifically is immeasurable. And today is his birthday! Not only that, but the very first post here, one year ago today, was a happy birthday post to him as well. 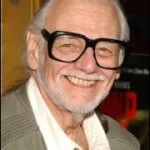 George A. Romero, you are my favorite zombie thing.